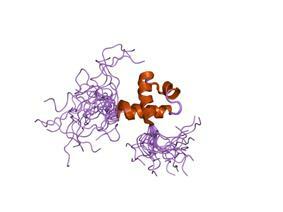 PDB rendering based on 2crg. 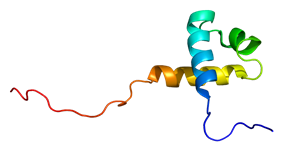 Metastasis-associated protein MTA3 is a protein that in humans is encoded by the MTA3 gene. ^ Fujita N, Jaye DL, Kajita M, Geigerman C, Moreno CS, Wade PA (Apr 2003). "MTA3, a Mi-2/NuRD complex subunit, regulates an invasive growth pathway in breast cancer". Cell 113 (2): 207–19. ^ Kumar R, Wang RA, Bagheri-Yarmand R (Nov 2003). "Emerging roles of MTA family members in human cancers". Semin Oncol 30 (5 Suppl 16): 30–7. ^ "Entrez Gene: MTA3 metastasis associated 1 family, member 3". Wade PA, Gegonne A, Jones PL et al. (1999). "Mi-2 complex couples DNA methylation to chromatin remodelling and histone deacetylation". Nat. Genet. 23 (1): 62–6. Nagase T, Ishikawa K, Kikuno R et al. (2000). "Prediction of the coding sequences of unidentified human genes. XV. The complete sequences of 100 new cDNA clones from brain which code for large proteins in vitro". DNA Res. 6 (5): 337–45. Venter JC, Adams MD, Myers EW et al. (2001). "The sequence of the human genome". Science 291 (5507): 1304–51. Simpson A, Uitto J, Rodeck U, Mahoney MG (2001). "Differential expression and subcellular distribution of the mouse metastasis-associated proteins Mta1 and Mta3". Gene 273 (1): 29–39. Strausberg RL, Feingold EA, Grouse LH et al. (2003). "Generation and initial analysis of more than 15,000 full-length human and mouse cDNA sequences". Proc. Natl. Acad. Sci. U.S.A. 99 (26): 16899–903. Yao YL, Yang WM (2004). "The metastasis-associated proteins 1 and 2 form distinct protein complexes with histone deacetylase activity". J. Biol. Chem. 278 (43): 42560–8. Ota T, Suzuki Y, Nishikawa T et al. (2004). "Complete sequencing and characterization of 21,243 full-length human cDNAs". Nat. Genet. 36 (1): 40–5. Mishra SK, Talukder AH, Gururaj AE et al. (2004). "Upstream Determinants of Estrogen Receptor-α Regulation of Metastatic Tumor Antigen 3 Pathway". J. Biol. Chem. 279 (31): 32709–15. Fujita N, Kajita M, Taysavang P, Wade PA (2005). "Hormonal regulation of metastasis-associated protein 3 transcription in breast cancer cells". Mol. Endocrinol. 18 (12): 2937–49. Fujita N, Jaye DL, Geigerman C et al. (2004). "MTA3 and the Mi-2/NuRD complex regulate cell fate during B lymphocyte differentiation". Cell 119 (1): 75–86. Gerhard DS, Wagner L, Feingold EA et al. (2004). "The Status, Quality, and Expansion of the NIH Full-Length cDNA Project: The Mammalian Gene Collection (MGC)". Genome Res. 14 (10B): 2121–7. Zhang H, Singh RR, Talukder AH, Kumar R (2006). "Metastatic tumor antigen 3 is a direct corepressor of the Wnt4 pathway". Genes Dev. 20 (21): 2943–8.